Because I’m That Good, That’s Why! It is funny, and almost kind of scary, that I can tell what type of attitude my 16 year old has, through a text message. I asked a simple question, and she replied with a snotty answer. What did I do? I told her to lose the attitude! Being rude through social media is not acceptable. You better talk to me electronically the same way you talk to me when we are in front of each other. And Yes, I can also hear you roll your eyes, from the back of my head where I keep an extra set of eyes and ears! No, this isn’t a hypothetical question. I have seriously been asking myself this question pretty much since the beginning of 2014. I would like to blame the non-stop snow that has been gracing Michigan since the end of October/beginning of November. OK, so maybe that can take some of the blame. I really do not like being cold. At all. But I have been very, very grouchy. And angry. And bitchy. the small things that I have shrugged off for the past several months are suddenly huge boulders of problems that I am carrying around on my shoulders. No, it isn’t that these small things are just happening over-and-over again and I have finally had enough. It is the little things that would not bother any normal-mood person (including me) are now enough to set me on edge. I have been feeling incredible for the past several months: I have made some positive changes in my life that have really been a huge improvement on my quality of life, for myself and my 4 girls. I have a wonderful job (no, really, it IS wonderful) that allows me to take care of my girls without any help from anyone, a nice home, my health, 4 healthy girls, a wonderful group of friends and co-workers, and a church family that help me stay grounded. So why don’t I feel as great now as I have been for the past several months? Believe me, I am not sitting around saying “Poor Me”. I truly know how lucky and blessed I am, and I say thanks for that every, single, day. I am just tired of the little stuff feeling like huge things. It’s not. It isn’t any bigger than it would have been if it happened last November. So since I have only lost about the first week of February (we won’t even discuss January), I really need to get it back in perspective, and quit sweating the small stuff. I know I need some “me” time. My girls and I have been stuck in the house together due to -20 wind chills and non-stop snow. Along with too many snow days to even count. No house is big enough for that much estrogen for that many days without some space. So here’s to February, and hopefully melting snow in March, and flower buds in April, and a better attitude than I have had. Here’s to being happy, just because I should be! Well That Wasn’t So Bad! I have officially made it through my first week of college for my MBA. I have to be honest and say this is only a 3 week course, to go over the school policies and requirements for writing essays, with about 6 assignments due a week, and 2 quizzes. Then I have a short break before the real fun begins; Research and Statistics. Yep. That type of class. The last one made me cry on a daily basis, nearly have a nervous break-down, and almost give up on getting my BBA. I’ve gotten over that though. I didn’t give up. I didn’t have a nervous break-down (I am honestly not exaggerating here, it WAS that bad for me). I am going into this next class with a positive, can-do attitude, and know if I keep the right attitude, the class will fly by. One thing I have noticed in 7 days, is I have no time to blog. Keeping my two blogs is my evening (morning for most of you) relaxation and unwind time. It’s what I do when I get home from work and get the kiddo’s up and off to school. 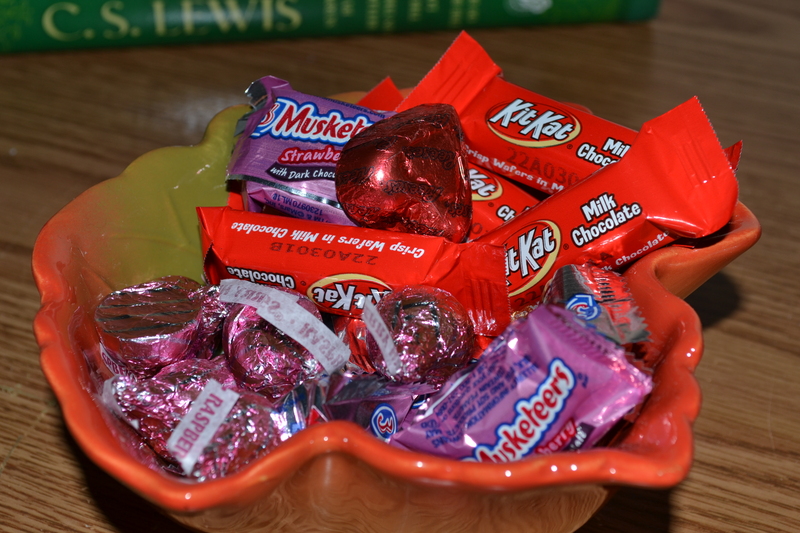 I dig into my bowl of chocolate candy sitting right next to my laptop (like that’s going to help me sleep!) Then it’s a movie in the DVD player, ear plugs in, eye mask on, and hopefully some sound sleep before the kids start coming home. So until I figure out how to add college back into my schedule and not give up the things I enjoy, my postings may be few-and-far-between. Here’s to higher education, and the things I willingly put myself through.